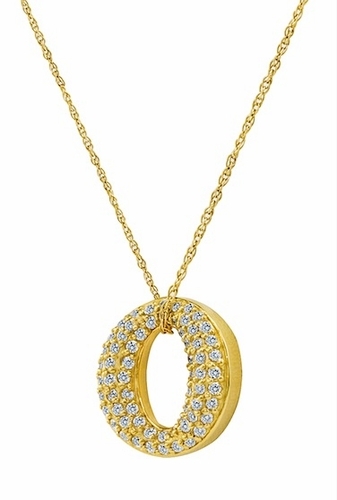 Our O Wreath Circle of Love Micro Pave Set Round Cubic Zirconia Pendant is encrusted with a multitude of pave set round diamond look cubic zirconia stones in a dimensional design. Approximately 1.25 carats of micro pave set round original Russian formula, diamond quality, cubic zirconia that are hand cut and hand polished to exact diamond specifications. 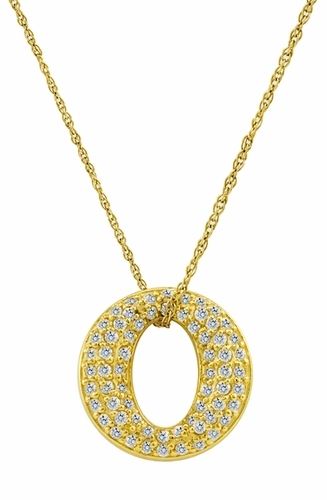 Available in 14k yellow gold, this free flowing pendant allows for a fine rope chain to be strung through the center opening and hang on the chain in a fun and creative manner. 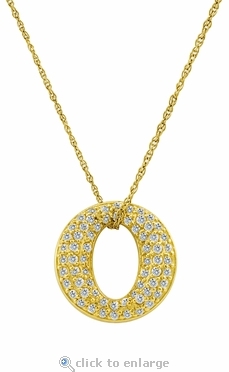 The letter O that this piece represents is also very similar to the pendant that was made popular by Oprah Winfrey. Choose from your choice of a 16 inch fine rope chain or an 18 inch fine rope chain, please see the pull down menu for options. This pendant can also be custom made in 14k white gold, or rose gold via special order. For further assistance, please contact us directly at 1-866-942-6663 or visit us via live chat and speak with a knowledgeable representative.